Our Products >> .221 Remington. Fireball with Lapua H/S, 1 Cartridge not a Box. 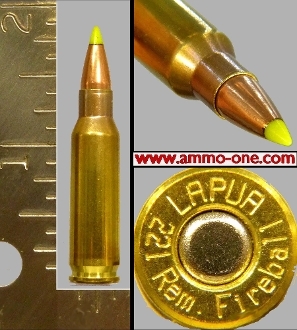 One Cartridge, not a Box: .221 Remington Fireball, new production using new Lapua Brass cases with "LAPUA 221 FIREBALL" HEAD-STAMP with a 50 grain, Hornady Z-Max projectile. PLEASE NOTE: This item is both a pistol and rifle cartridge and is in both rifle and pistol collectible categories. History of th2 221 Remington Fireball caliber. Due to the demand for varmint hunting and silhouette shooting, the .221 Remington Fireball cartridge was introduced by Remington in 1963 for the (then new) Remington XP-100 pistol (now an obsolete firearm). The cartridge is based on a shortened .222 Remington cartridge with a .22 caliber projectile, a velocity of (up to) 2,650 feet per second and (up to) 765 foot pounds per square inch of energy; "that is over the 357 Magnum". Some also consider this a rifle cartridge. .221 Remington. Fireball with Lapua H/S, 1 Cartridge not a Box.